Booking fantastic victories at local, regional & provincial level with fantastic arrivals while you can see the opening of some nice perspectives for the national championships of the KBDB: it's time to make the first balance of the 2018 season for the combination Casaert-Sénéchal and we must say it will probably be an unbelievable one! Sébastien avec sa championne de 2018. Sébastien Casaert doesn't really need an introduction. 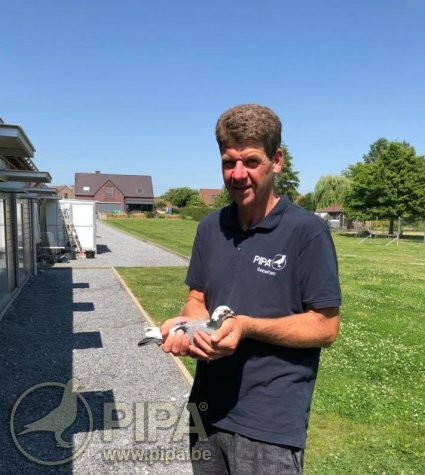 Being a pigeon fancier since his birth, he is the son of the legendary Maurice Casaert and he will become himself a legend. Sébastien is know to be a wisperer from the pigeon sport, a skilled fancier who has this so called 'know how' who allows him to feel perfectly the things at the right moment. The person who think they know everything about the pigeon are probably lying but we are forced to admit that there are some fanciers able to see the things better and faster. Sébastien is one of them. And when you give exceptionnal pigeons to such kind of fancier, the results are fantastic and superior to the average. Two years ago, Sébastien accepted the proposition of Nikolaas Gyselbrecht: racing under the PEC banneer with pigeons exclusively bred by the PEC. It allowed Sébastien to get some flying machines but also to focus exclusively on the racing aspect of the pigeon sport. For him, earning so much time is priceless because the only thing he has to do now is to make sure to get the full out of his racing team but also from himself. In total, no less than 34x top 100 national until the 30th of june!!! The notorious 'Porsche 911' is currently the main pigeon behind the PEC project and it seems that the season 2018 will be marked by his impact until the last weekend of competition. A few weeks ago, we already talked about its influence on the racing team from the Racing Team ADK colony (click here to read the report published a few weeks ago). It seems that it is now also relevant to the Casaert-Sénéchal racing team. Like we said in the introduction of this report, some nice perspectives are currently opened for Sébastien for a classification into the national championship of the great middle distance ace pigeons KBDB who became a reality thanks to the 498/17 who just booked her 4th necessary prizes for a ranking on the race from Guéret with the 18th national against 8.493 yearlings. Now, we just have to see if she can improve her coefficient and which ranking she can end to. This being said, Sébastien already excelled on this discipline as he already won the titles of 1st National Ace Pigeon Great Middle Distance Old Pigeons KBDB in 2013 (with 'Nikolaas') & 1st National Ace Pigeon Great Middle Distance Yl KBDB in 2011 (with 'Amalia'). By the way, the 498/17 is a granddaughter of this famous 'Amalia' (sold to PEC after her title). It prooves once again that the apple doesn't fall far from the tree. For Sébastien, this obviously represent a symbolic since despite the fact he races the pigeons he received from the PEC, his current best racer is bred from the line of one of the best pigeon he ever raced. The 498/17 has also some of the same caracteristics 'Amalia' had when she was the star of his racing loft. The best from Bart Geerinckx as it's a direct son of 'Blue Lagoon' (father 'Little Star', 1. National Ace Pigeon GMD KBDB '15) & de 'Acy' (2. National Ace Pigeon GMD KBDB '13 & Olympic Pigeon Nitra '13). She is also bred from a fantastic pair: 'Porsche 911' x 'Amalia', so 5. National Ace Pigeon GMD KBDB '15 x 1. National Ace Pigeon GMD KBDB '11. Son of the now legendary pair 'Wacko Freddy' x 'Lieve', main breeding pair from PEC. Superb breeding hen who already bred several toppers. She is a daughter to 'New Freddy' x 'Noor', direct Gaston Van de Wouwer with a.o. to her name 1. interprovincial Vierzon 10.480 p. (highest speed from 15.359 p.). On Brive, two yearlings bred from the same pair brilliantly accomplished their test as they were both classified into the national top 28. Their grandfather (mother side) is the famous 'Porsche Cayenne', a full brother of 'Porsche 911' and then bred from 'Wacko Freddy' x 'Lieve'. Daughter from 'Porsche Cayenne' (full brother 'Porsche 911') x 'Blue Gala', super racing hen with a.o. 80. Jarnac nat 4.559 p. & 97. Jarnac nat 4.167 p.
On that same race, Tom Van Gaver won the first national but also the 11th national Brive against 4.412 yearlings bred from a full brother of 'Porsche 911' (click here to check his pedigree). Concerning the race of Guéret, of course we are still thinking about the performance of the '498/17' (see above) but there is more: we must also talk about the '393/17' and the '405'/17', two hens closely related to the 'Porsche 911' line and who won that day the 40th & 82th national Guéret against 8.493 yearlings! 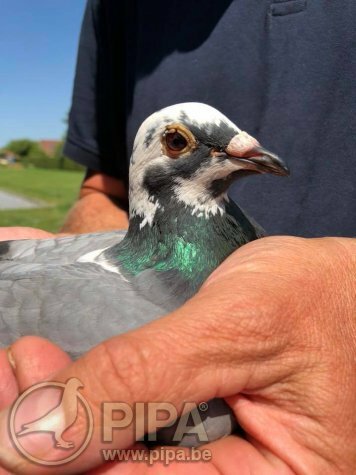 Her name says it all, he is a son of two phenomenal pigeons, being the worldwide famous 'Gladiator' from Bart Geerinckx (who doesn't need any further introduction) & 'Amalia', 1. National Ace Pigeon GMD Yl KBDB 2011. Superb inbred hen out of the Porsche line as direct daughter of the 'Porsche 911' while coupled on his own mother, the fantastic 'Lieve' which is at her turn a daughter of the 'Gladiator' Geerinckx! By the way, the same crossing between 'Porsche 911' x 'Amalia' bred the '498/17' who has been introduced in first. Moreover, the nest sister of the '393/14' (the '394/14') won this year a.o. the 24th Brive nat 4.384 p. & the 114th Bourges nat 19.133 p. ... what a class! 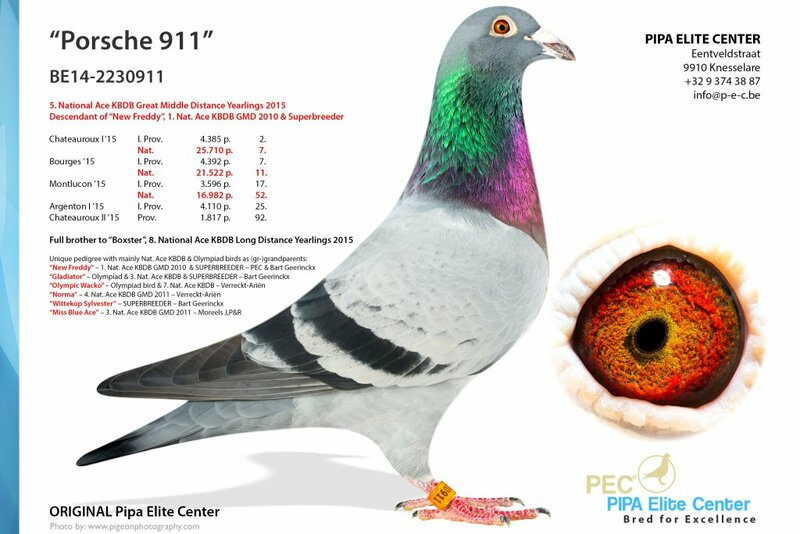 Main pigeon of the PEC, almost a legend at the age of 4 only! Superb hen who won a.o. the 1st Bourges nat from 19.735 pigeons in 2016 but also 5x top 140 national against at least 16.900 pigeons! It's a daughter of the super pair 'Dali' x 'Magic 700'. We are curious to see what will reserve the next weeks of competition, mostly on the one day long distance race where this loft will certainly try to win a few classifications into the national ace pigeons from the KBDB. Anyway, Sébastien Casaert is now sure to attempt to the national days at the end of the year. But will he get back home with one or several medals? To be continued. The performances booked over the last few weeks on the national races are know by everybody and that's the reason why we will only talk about the results of the very races of the season, so from sprint and middle distance. During these races, the Casaert-Sénéchal pigeons showed great signs of condition. Click here to check all the results won in 2018.